Last Thursday when we came back to school after the Christmas holidays the ground was hard with frost and it was very cold. 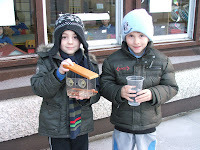 Teacher told us that the little birds would not be able to find any worms now so we decided to put out our bird feeder. We put some nuts and water into it and then we put it on the outside of the window. 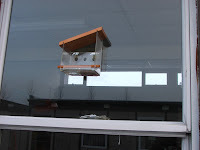 We will check each day that there is food there for the birds so that they will not be hungry.